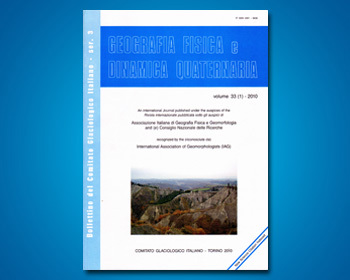 BRANCUCCI G. & PALIAGA G.
The research here synthetically shown regards the geomorphic characterization of the main twentyrwo basins in the ligurian region. The aim is to give a new instrument of analysis to the study of the geomorphic evolution of the basins. We used three different kinds of approach: the quantitative geomorphic analysis of the basins, the analysis of the fractal dimension of the hydrographic networks and the statistical analysis of two kinds of erosion features, the confluence between rivers and the discontinuity in the slope of the watersheds within the basins. The basins are generally characterized by a low level of hierarchical structure, while the prevailing forms are extended in a direction almost perpendicular to the coastline; besides the erosion processes seem to be strong in almost all the basins . We have analyzed the distribution with the altitude of the junctions between rivers (particularly the junctions between two rivers of first order and two rivers of second order sensu Strahler) and the sudden changes in the slope of the watersheds within the basins. The two distributions follow the same trends both in every basin and regarding the trend of the more frequent altitude class. This trends seem to be related to the erosion cycles that have interested the basins. Finally the characterization given by the three approaches here presented seems to allow a division of the area in three zones where the data are substantially homogeneously distributed.